(Left) Althyrium niponicum ‘Applecourt’ and (right) Athyrium niponicum ‘Regal Red’. A friend that was recently visiting my garden commented that I had quite a few containers with ferns. Until he said it, I had not really noticed. The next day as I walked around my garden, I realized that it was true. I have been gradually adding ferns into my garden. Was this just me, or have other gardeners also been planting more ferns? Checking with several local garden centers and a local specialty nursery, they all agreed that both sales and awareness of ferns for the home gardener have been increasing over the past few years. Several years ago in a typical garden center, there may have been a half dozen different varieties of ferns for sale. That number has probably tripled today. There are enough varieties of ferns now available that they are allotted a special location at Portland Nursery. Suzy believes that our native sword fern is underused. In fact, they could be used in many landscape settings, including as a ground cover as long as the area isn’t walked upon. 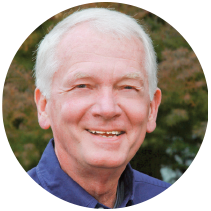 Peter Eastman of Al’s Garden & Home in Wilsonville, Oregon feels likewise. “Ferns are a workhorse,” he said. Peter went on to say that given the right location, once established, ferns need very little care. Al’s Garden & Home has a large assortment of ferns in their “perennials for shade” section. Peter has been experimenting with ferns in his own garden and appreciates them for the diversity of colors and textures. Some are evergreen and some deciduous and there are some varieties that will withstand more sun than might be expected. He has many containers throughout his garden with ferns and his experience in growing them gives him some expertise that he can pass on to customers. Joy Creek Nursery in Scappoose, Oregon, carries 25–30 different varieties of ferns. Co-owner Maurice Horn has seen a renewed interest in woodland plants and especially native plants which, of course, would include some ferns. Not only have sales of ferns increased, but the number of varieties available also continues to increase, he said. Joy Creek Nursery is constantly adding new varieties and finds that customers often seek out that which is new. Adding the word “new” to a plant can often attract instant attention. Maurice often suggests to customers that they mix ferns with other plants, such as hydrangeas and hostas, that like a similar setting in the garden. He also suggests to customers that many ferns are ideal in containers for small, shady spaces that many apartments have and can provide color without flowers all season. 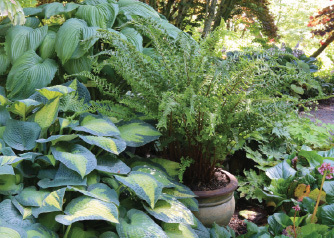 “If you have a black thumb, start with ferns “ is the advice of Thomas Johnson, co-owner of Sebright Gardens in Salem, Oregon. Started in 2004 as primarily a hosta nursery, Sebright Gardens has continually expanded its plant palette and now offers about 150 varieties of ferns, making it one of the largest fern retailers in the Northwest. Sebright Gardens has a beautiful display garden which has become an excellent resource for gardeners to visit and see how ferns can be worked into a landscape setting. From talking with Thomas on a recent visit, here are some favorites. 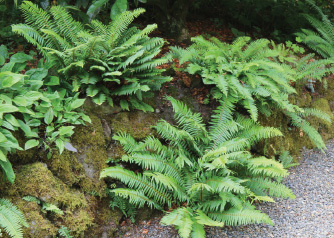 The varieties shown have been selected to offer some examples of the diversity that ferns can offer and also have been selected due to their being relatively easy to obtain. These photos were taken in the display gardens at Sebright in June. Dryopteris affinis Cristata ‘The King’. • Golden scaled male fern ‘The King’ (Dryopteris affinis cristata ‘The King’) — This is a fern that performs well in a container and makes a magnificent statement when mixed with hostas. The early spring growth is covered in golden scales. An easy fern to grow, it is adaptable from shade to partial sun. For a first-time fern grower, this would be a good selection to begin with. • Chilean hard fern (Blechnum chilense) — This native of Chile and Argentina has been awarded the Royal Horticulture Society Award of Garden Merit. Chilean Hard Fern spreads by creeping rhizomes and has orange bronze new growth, which is spectacular in spring as the new fronds emerge. • Lady in red fern (Athyrium angustum forma rubellum) — A beautiful specimen fern for the garden and a superb fern for a container. Lady in red fern was discovered in Vermont by a volunteer at the New England Wildflower Society. It has become very popular due to its general hardiness and burgundy-colored stems. • Applecourt painted fern (Althyrium niponicum ‘Applecourt’) — This one is outstanding for foliage. This fern is a spreading mound of burgundy, gray, silver and dark green fronds. It is a deciduous fern and goes by the common name of Japanese painted fern and sometimes by crested Japanese painted fern. It is easy to grow and likes a humus-rich soil with good drainage. 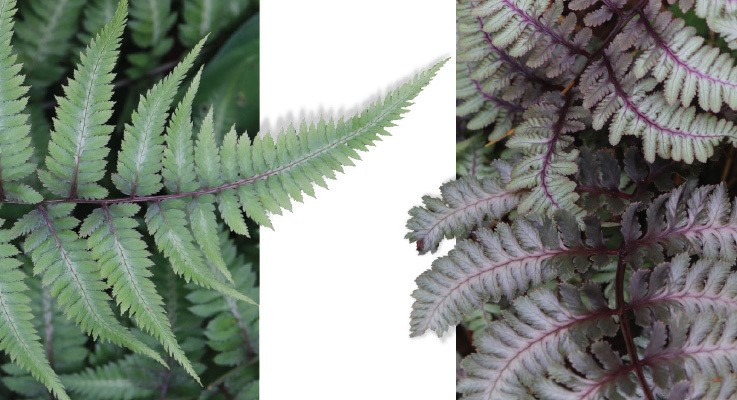 The best frond color occurs in light shade. The plant will reach about 18 inches in height. • Regal red painted fern, (Athyrium niponicum ‘Regal Red’) — This is another beautiful fern with fronds of dark violet and bright silver. Standing over this fern and looking down can give the appearance of looking at a tapestry. The fronds are often used in cut flower arrangements and this fern is an excellent container plant. It is best planted in light shade to full shade. • We should not forget our western sword fern (Polystichum munitum) which is often overlooked as a landscape plant. It is tough, reliable, low maintenance and can adapt to many different types of locations. I have seen it growing in a woodland setting as well as in rock walls and it seems to thrive in both locations. Try using it as a mass planting in a woodland setting or around fir trees. In a local natural area near my house, it looks good all year and in a garden it would look even better by removing the old fronds in the spring. Removing the old fronds is about all the maintenance needed. Gardeners are always looking for new ideas. Many garden centers have classes to discuss new plants, old favorite plants and new ways to look at plants. Perhaps growing ferns should be part of this mix next spring. Joy Creek Nursery recently held a class “Ferns and Making Fern Tables.” I believe that most gardeners would not have a clue as to what a fern table is, but this was an opportunity to find out. The class was well attended and taught by Richie Steffen, co-author of The Plant Lover’s Guide to Ferns, an excellent reference he wrote with Sue Olsen which was recently published by Timber Press. 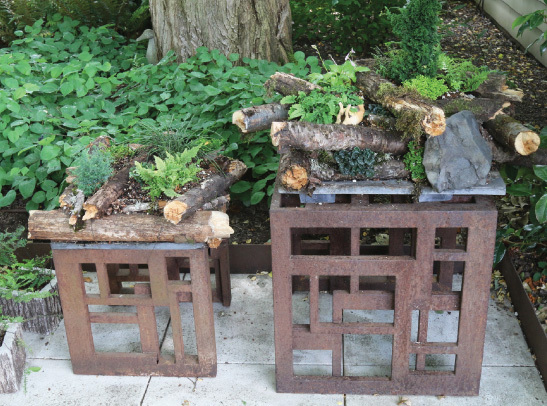 Craig Quirk created a fern table at Joy Creek Nursery’s gardener class. Portland gardener Craig Quirk attended, and after the class, he decided to make his own fern table for the entryway of his house. This entryway is shaded by a large tree, making it ideal for many ferns. The photo was taken shortly after it was made and by the end of summer, it will have filled in nicely. Many garden centers have probably already realized the emerging market for fern sales. Since planting ferns is new to many gardeners, I suggest having some displays to show how they can be used. 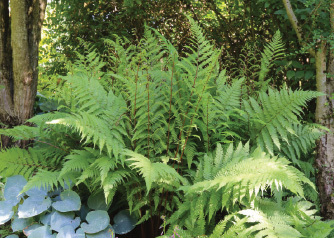 In the spring, a class on which ferns are easy to grow for the particular area you are in and tips on how to grow them would be an ideal subject. Also, with many people living in apartments or condominiums, ferns could be a nice addition for a container in the small space they might have. Most gardeners probably would probably not think of a fern but this is where the garden center steps into the picture. Ferns are not just a fancy frond!